Fireworks scare animals, and cause stampedes and accidents. They can also cause pregnant animals to abort. The best idea is not to have fireworks near the open Forest where there are animals about. If you must have fireworks then let the local farmers and horse-owners know. Give them plenty of time to get their animals in. Ponies and other animals can be very stressed by sudden loud noises, so think twice before buying fireworks if you live in or near the Forest. 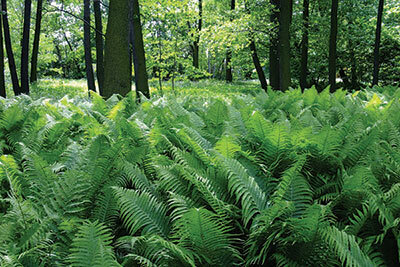 Fern, or bracken, used to be cut and collected by commoners as a cheaper alternative to straw for bedding animals. They had to get permission to do it from the Forest Keeper (see K). Commoners would build big stacks of fern, and thatch the tops with reeds to keep the rain off. Fires of dried fern were used by commoners to burn the bristles from the skin of slaughtered pigs. Fences are very important in the Forest. Fencing the boundary, or the ‘perambulation’, of the Forest, was finished in the 1960s. Before then, animals used to wander off to neighbouring towns and villages, and had to be led back. They were called ‘lane creepers’ because they worked down the roads feeding on the verges and hedges. If they broke onto farmland they would damage crops, so farmers used to catch them and charge commoners to let them out. Today fences help prevent accidents by keeping animals away from the busier roads.